We are introducing top 7 traditional festivals in Kyoto, July 2017 to you, recommended by MagicalTrip’s Local Staff in Kyoto! You will be feeling local atmosphere and will experience traditional lifestyle in the best way through these festivals. You will be able to enjoy the traditional festivals much more and it will become a highlight of your trip to Kyoto if you are dressed up with a rental Kimono! In addition to traditional festivals, we are introducing several kinds of must-see events in Kyoto, July 2017. There are three major festivals in Japan; Osaka’s Tenjin Festival, Tokyo’s Kanda Festival, and finally, Yasaka Shrine’s Gion Festival. Gion Festival is not only known for its long history (started 1100 years ago!) but also for its gorgeousness and festival itself lasing for 1 month. Everything in the city of Kyoto will be related to Gion Festival during its period. Visitors come for this festival from all around the world making second visit to Kyoto just for this festival worth it. 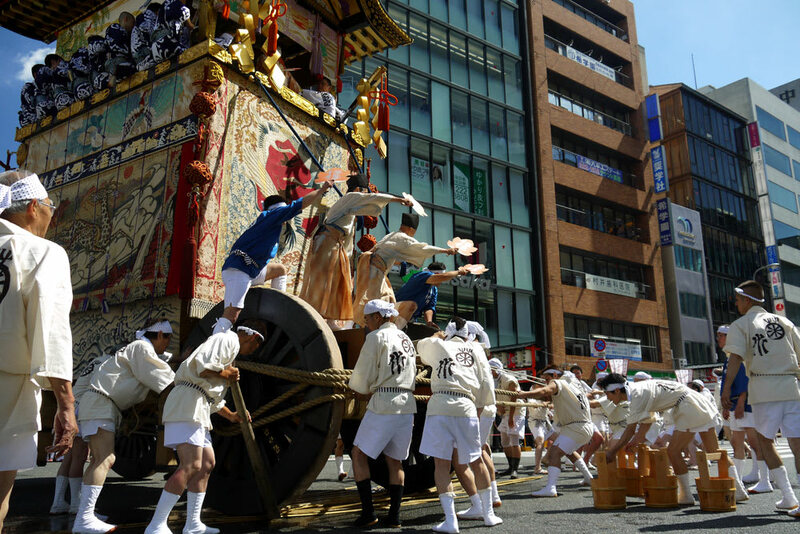 The main event of this festival is mikoshi parade of unique mikoshi known as Yamabako. There will be 23 gorgeous Yamabakos lurking around the town for 2 hours starting from Shijo Karasuma intersection, the center of Gion. Such event, known as “Kyoto Gion Festival’s Yamabako Event” is registered as cultural heritage at UNESCO. Don’t miss this amazing historical event held at historical town Kyoto. For free & there are also paid seats. Paid seats are from 3,180 yen & need to reserve in advance. Amanohashidate Monjudo Ship Festival is a replication of “Kusenoto Engi”, a legend at Chion Temple. Chion Temple is an old temple with history that appears in famous Japanese art “Amanohashidate-zu”. 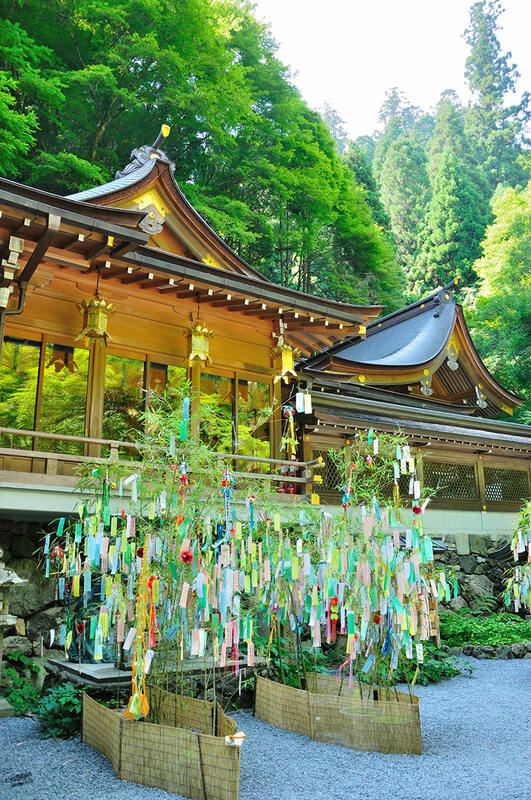 The temple is also known for being located near one of three scenes of Japan Amanohashidate making it a must visit. The festival’s main event consists of two gold and silver dragons dancing with taiko on a platform on sea lit with torches. The event will be closed with countless fireworks coloring the night sky. If you are visiting Amanohashidate from Kyoto, try to adjust your schedule to match this festival. This festival is held at Jishu Shrine, Kyoto famous for God of Marriage thus attracting couples and young females wishing to find a good partner. The praying would be done by writing one’s name and partner’s name on paper kokeshi resembling Orihime and Hikoboshi, a couple that appears in Tanabata fairytale. Then the participants will tightly tie the two papers together and hanging on Oosasa (Big Bamboo) in the main shrine. If one does not have a specific partner, then he or she can write down characteristics of ideal partner. In addition, within the shrine’s precinct of the Jishu Shrine, there are two “love fortune-telling stones” dating back all the way to Jo-mon age. If one can successfully walk from one stone to the other, it is said that person’s love will come true. If you are in love or traveling with your partner, something good might happen upon visiting. Kifune’s Water festival is a festival of high formality held at Kifune Shrine, Kyoto to appreciate the blessing of water and pray for future blessing to the God of Water praised at the said shrine. There will be dedication of tea by teacher of Urasenke, a prestigious Japanese tea ceremony, traditional Japanese dance, and knife technique performance involving carving of fish without using their hands by teacher of Ikama way, all within the shrine’s precinct. Gathering of so many traditional Japanese culture is very rare making this event a must see if visiting Kyoto. In addition, during the event season, the shrine will be lit revealing a different view of Kifune shrine from dawn that can only be seen during this festival. Taiza Minato Festival is a fisherman festival held on July 25 every year in Taizako at the Tango-cho, Kyotango, Kyoto praying for their safety at sea. The highlight of the festival is at night, where you can see many fishing boats light their lamplights while fireworks burst in the night sky. Taizako is also famous for their matsubagani crabs, branded as “Taia crabs” which is definetly worth trying! Sei Daimyoujin Festival, Tanabata Festival is held at Shiramine Jingu in Kamigyo-ku, Kyoto City is known for divine favor related to sports, especially ball game. This is because the god that is enshrined at Sei Daimyoujin is God of “Kemari”, a hobby Japanese noble families called “Kouke” enjoyed for 1,000 years. The festival starts with dedication of concert and dance of Japanese Gakaku, followed by kemari, concluded with this festival’s main event, local girls’ komachi dance. Komachi dance involves girls in charming costume singing and playing the taiko around the tanabata decoration. This festival is held in Kitano Tenmagu whichi enshrines Sugawara no Michizane, politician of the Heian period and the God of academics in Japan. Every month on the 25th, there is a special day called “Tenjin san” to celebrate Sugawa no Michizane’s birthday. From around 6 AM to 9 AM, over 1000 stalls open selling various items such as antiques; it is often crowded with people from all over Japan. At sunset, the shrine is lit up along with 350 stone lanterns and 250 fishing lanterns. You will feel like you have walked into a different phase of the world being surrounded by the whimsical lights of the shrine.